EURUSD is moving with bearish tendency creating lower highs and lower lows. The weak export and trade balance data in Germany also did not influence this pair much. 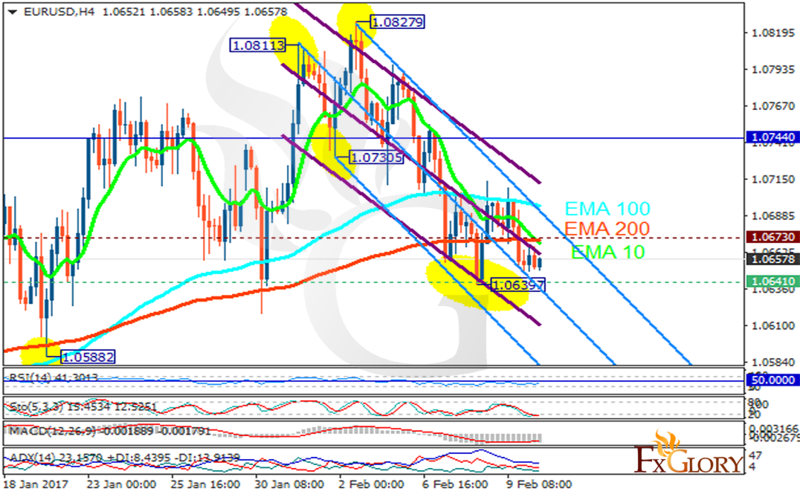 The support rests at 1.06410 with resistance at 1.06730 which both lines are below the weekly pivot point at 1.07440. The EMA of 10 is moving with bearish bias and it has already crossed the EMA of 100 and the EMA of 200. The RSI is rising towards the 50 level area, the Stochastic is showing downward momentum and the MACD indicator is in negative territory. The ADX is showing a weak sell signal. The pair will continue its decline within Andrews’ pitchfork. Short positions are recommended targeting 1.0600.